FileRoads 098 - Part of the Albany Road, Sheet 4 (crosses Beaufort River) by H.S. Ranford [scale: 30 chains to an inch]. FileRoads 099 - Part of the Albany Road to Kojonup, Sheet 5 by H.S. Ranford [scale: 20 chains to an inch]. 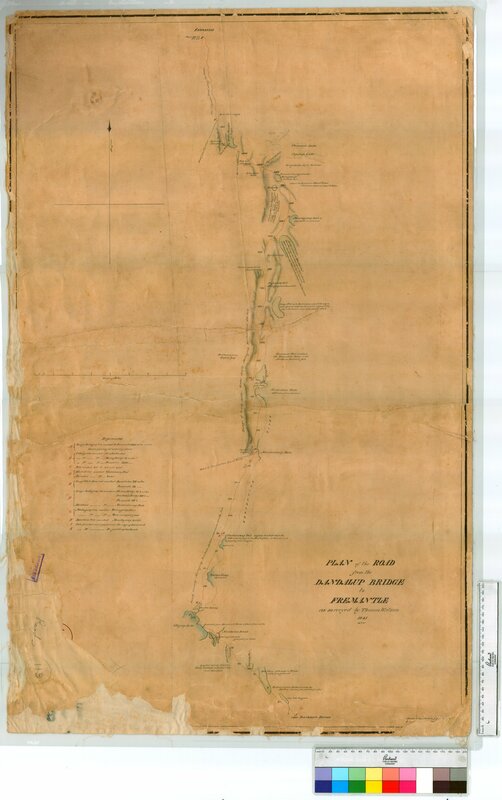 FileRoads 101 - Road from Albany to Perth (crosses 11 mile bridge), sheet 2 by P. Chauncy [scale: 12 chains to an inch]. FileRoads 114 - Road to Bunbury by J. Cowles, Fieldbook 3 [scale: 40 chains to an inch]. FileRoads 119 - Road from Dandalup Bridge to Fremantle by T. Watson [scale: 1 mile to an inch]. FileRoads 120 - Roads between the Wellington and Williams Districts by F.T. Gregory [scale: 1 1/2 miles to an inch, Tally No. 005477]. FileRoads 124 - Road between Wellington and William Districts (between Ommanney Road & Williamsburgh) by F.T. Gregory [scale: 1 1/2 miles to an inch]. FileRoads 125 - Post Road from Bunbury to Kojonup by A.C. Gregory [scale: 1 1/2 miles to an inch]. FileRoads 126 - Sussex Roads, road Busselton to Margaret River to Dunsborough, by Carey [scale: 100 chains to an inch]. File Roads 119 - Road from Dandalup Bridge to Fremantle by T. Watson [scale: 1 mile to an inch].